On my way out to get some lunch today, I stopped in my lobby to see if the mail had come. It had, and during a cursory glance through this week's New Yorker, a photograph on page 12 really jumped out at me. It was a nice-light shot of a man walking on the street near a corner grocery store. 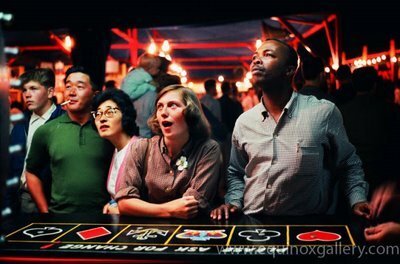 The photo (right), was taken by somebody named Fred Herzog. The name didn't immediately ring a bell, and I certainly don't know of a Powell Street anywhere in New York. So after I got back I looked him up on the Internet. 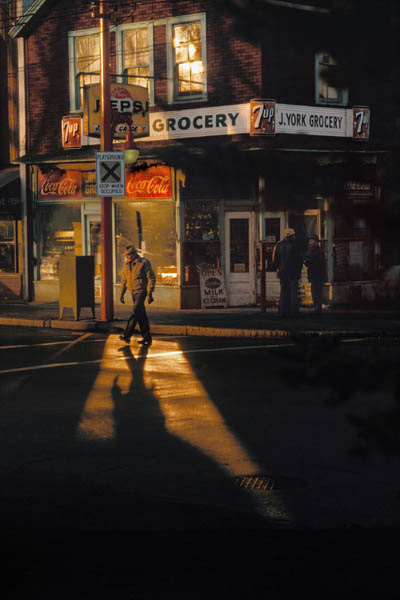 I quickly learned that most of his work was taken in Vancouver in the 1950s and 60s. He's got a show up at Laurence Miller Gallery on 57th Street, actually it's a two-man show along with David Plowden. I will try to get up there as soon as possible. I am especially encouraged to do so because I was able to find so many of Herzog's images online. 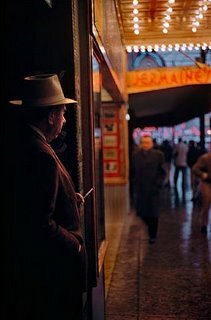 And I will certainly be on the lookout for a book of his work, Fred Herzog: Vancouver Photographs, published by Douglas-McIntyre Publishing Group. What interests me most is how I came across a couple statements about Herzog being overlooked as a photographer back then because of his use of slide film, mostly Kodachrome. Supposedly this "marginalized him somewhat" because most "art" photography back then was in black and white. Conversely, I read elsewhere that he "bucked the norm" by shooting slide film. On a different-but-not-totally-unrelated-note, I have to mention one of my favorite photography books, one that I have shot many copy slides from to show to students, Americans in Kodachrome, which came out several years ago. Anybody who knows me knows that I am passionate about how photographs "age" over time, how our perceptions of photographs change, etc. As for the idea of Herzog being overlooked, I'm very curious to find out how he got "discovered." At any rate, I cannot help but wonder what they'll say in 50 years about a photographer shooting early 21st Century NYC with black and white film at the dawn of the digital era. I want to link to some slide shows I found online. There's one at Douglas McIntyre's site. Another one at a Vancouver gallery, Equinox, has a great selection here. Finally, the Laurence Miller site has another one here (currently posted as "currentexhibition.htm" so I'll have to update the link in a few weeks). 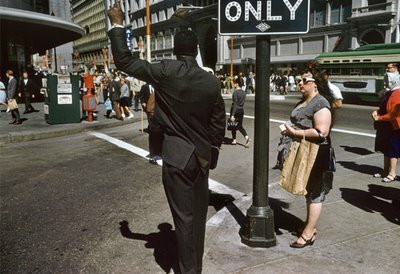 Some reviews speak glowingly of his work, "brilliantly coloured photographic slides [which] still look as fresh today as they did the day they were snapped.” He captured "the buzz and energy of a young, emerging West Coast city." Another declares "the photographs themselves are the star of the book and Vancouver – mostly downtown Vancouver, showing its modernist past like a piece of torn lining dangling from a tattered sleeve – is the star of the photographs." Finally, he is proclaimed "the city’s premier street photographer… Replete with vacant lots and abandoned cars, his images invite the adjective authentic." I was happy to see Herzog as a wikipedia page. And his official website says very little, other than his work comprises "the only comprehensive body of documentary/art photography of Vancouver in existence." I read somewhere that this exhibition and the book were taken from 80,000 pictures he had taken. I divided that by 36 to come up with approximately 2,222 rolls of film. While the vast majority of his work is from the 50s and 60s, I did see a date from as early as 1953 and as late as 1984. So over thirty years, give or take, that's 74 rolls per year. That's much more along my pace (I'm averaging just over 100 rolls/year), compared to Winogrand, who had 2,500 undeveloped rolls at the time of his death. All photos by Fred Herzog. From top, Jackpot, 1961; Crossing Powell, 1984; San Francisco, 1962; Flaneur Granville, 1960.